One of my new hobby is to take night scene pictures. I just knew that my tiny waterproof and shockproof camera could handle it, given I could manage the camera to stay still. It could be challenging sometimes since we are too lazy to carry around a tripod with us. So I usually use stones, brochures, wallet, or anything I can find that can give the right angle of the scene to my camera and let it stay still. Here are the highlights of my Sydney night shots. These first few were taken during the Australian Idol finale. They had this event beside the Sydney Opera House. 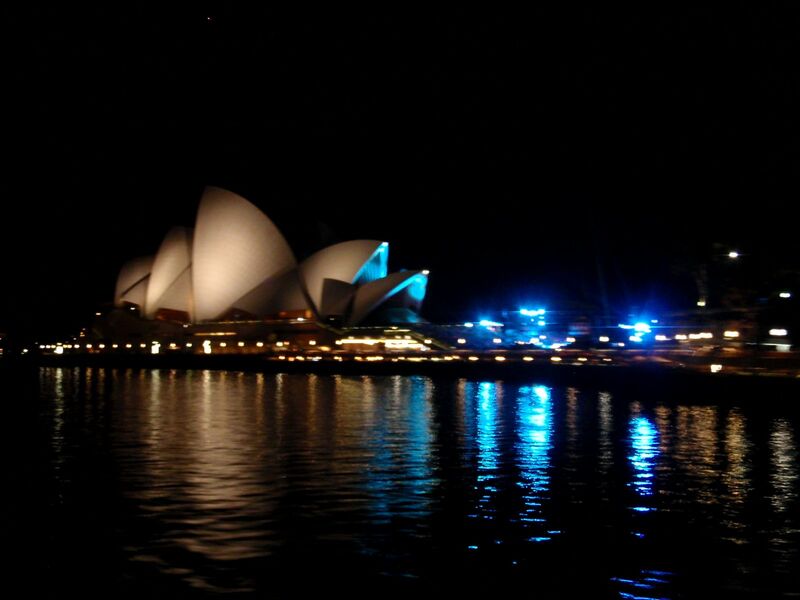 Sydney Opera House, before they announced the winner of the Australian Idol 2009. 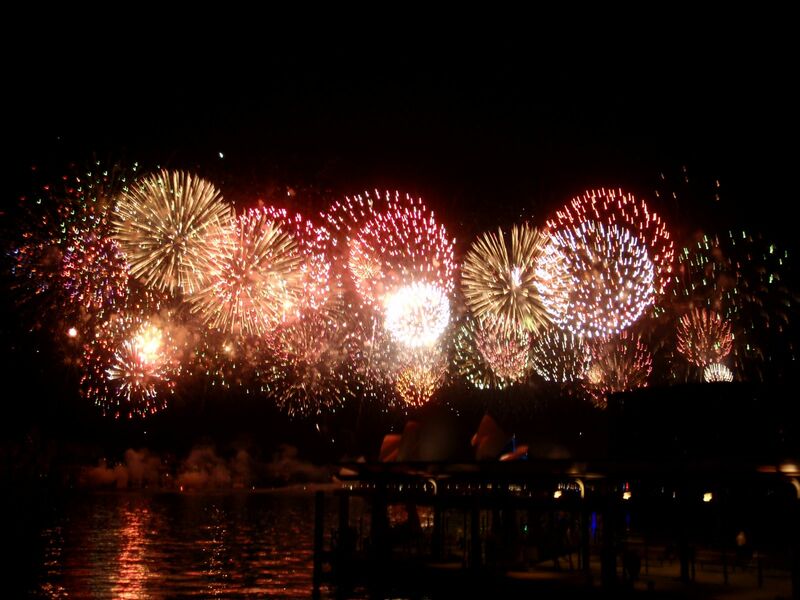 Fireworks over the Sydney Opera House, celebrating the new winner of the Australian Idol 2009. A spectacular fireworks wasn’t it? We were lucky to happen to be around there just right during the fireworks show. We had no idea that the Australian Idol finale was performed that night. 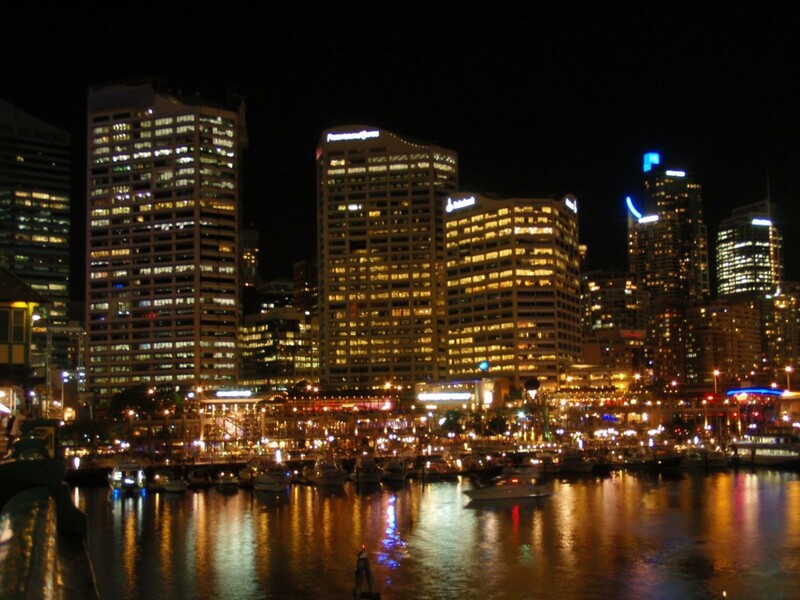 The followings were taken around the Darling Harbour of Sydney, a harbour that was turned into a pretty restaurant and entertainment district, close to downtown Sydney. 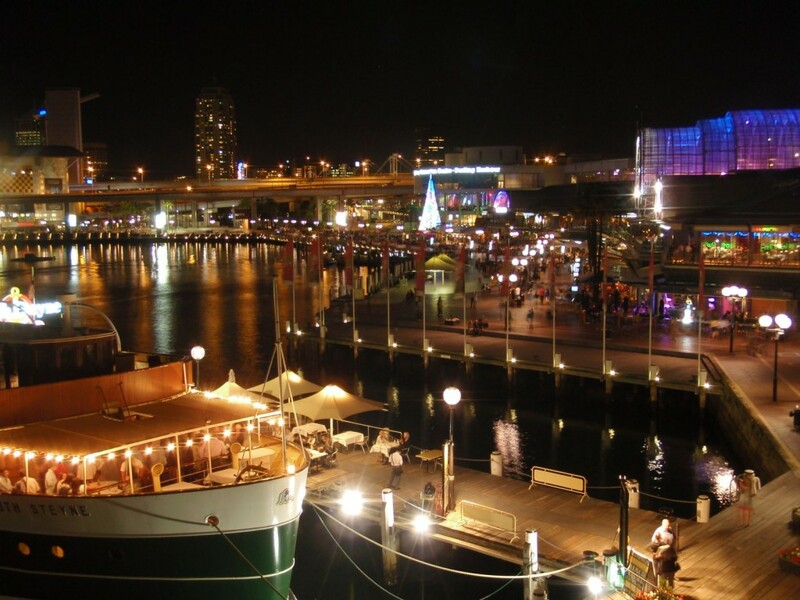 Darling Harbour in Sydney, taken during the Christmas season. Notice the Christmas tree. Downtown Sydney taken from Darling Harbour. 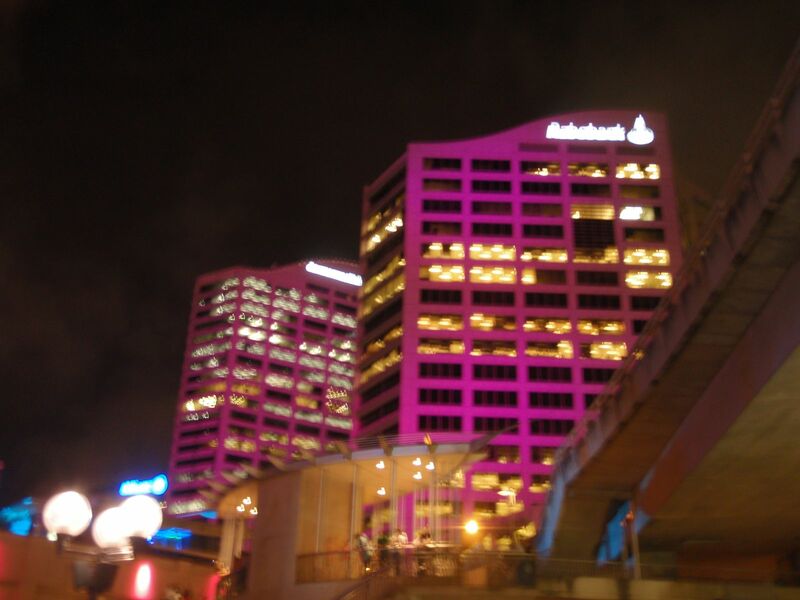 Now, here is a pink building, the Rabobank Sydney, that I usually remember as “Robobank”, on the preparation of the Australia Day. Just in the case you are wondering, this building is usually coloured just the regular grey. The pinkness was a result of illumination. Too bad the picture is a little bit blurry, but I like it anyway since it was too bizarre. Pink Rabobank. I do realize that this is slightly blurry, but I can't stop myself posting this up because it is pink! 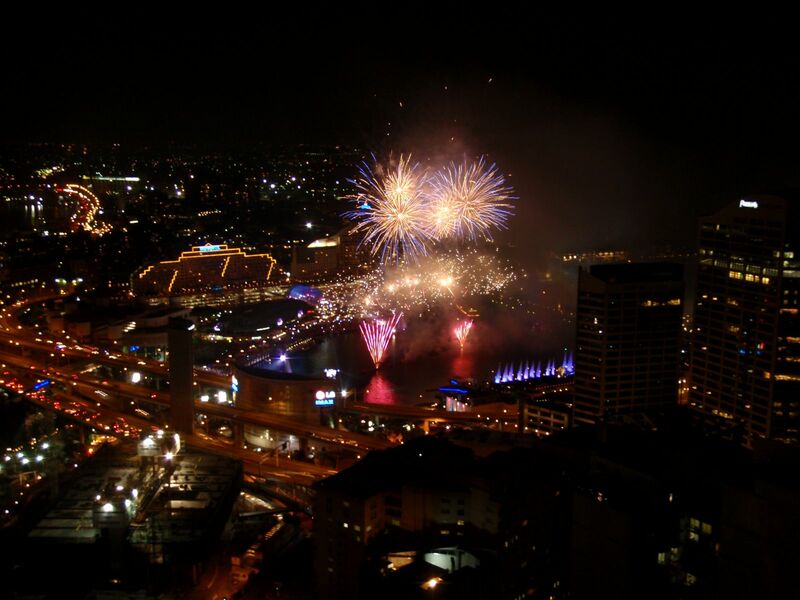 Finally, the Australia Day spectacular light show and fireworks at Darling Harbour. 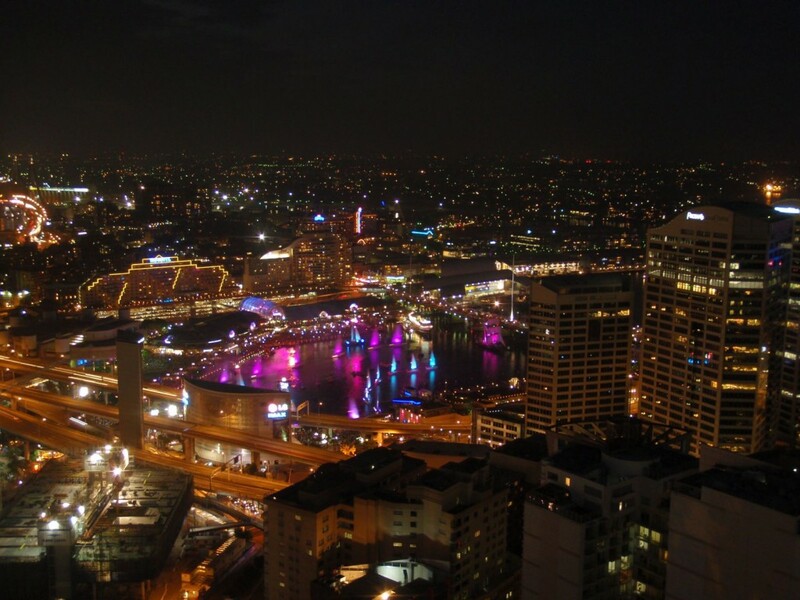 We didn’t go to Darling Harbour that night, even though it was only 10 minutes away, since for the first time we had our chance to view this from high up. It was so great! Australia Day's light show. Look at the pretty illuminated sail boats floating in the harbour. That’s it for now from Sydney! Wow these are incredible! I love the last one. I was there that night!! Miss it. Hope you enjoy your last few days in my favorite city! Thanks Lauren! I love the Australian day fireworks more than other fireworks they have in Darling Harbour. It was the whole set! Did you watch the fireworks too? I like the Darling Harbour one! Ohhh, you guys, those are great photos!!!! I love the pink building! Too bad I couldn’t see more of the nighttime scenes last night. I think I will come back – even though it’s a 1 hour 20 minute train ride, followed by a 40-minute bus ride, then a 15-minute walk home. It was worth it to meet your guys!